Myth: Posting on Facebook will help you rank at the top of search results. Not true. Although Facebook can be part of a valuable marketing strategy, you can post on Facebook a million times and still not have any impact on your website–or your business–getting found by new customers. So, thank you to my reader for sending that. Those are all great questions. First of all, a brief word of caution. If anyone tells you they’re going to improve SEO by helping you post to Facebook, I recommend you consider looking for a different vendor. Although Facebook can be a valuable part of an overall marketing strategy, Facebook posts will not do anything directly to improve your ranking on the search engines. And, while it’s possible to make an impact on SEO for $99/month, many of the packages I’ve seen at that price are smoke and mirrors, and I’d ask a lot of questions before buying. Where social media can have a small impact on SEO is when a lot of people are actually talking about you on social media. And that doesn’t happen just by posting on Facebook (or Twitter, or anywhere else). The good news is that you do have options. And in a minute I’ll talk about what does work for SEO. But first I want to clarify something the reader said. Actually, I do post on social media. I have some clients for whom that’s an integral part of their content marketing strategy that we helped them develop. We also do a very good job with Facebook marketing for certain types of clients. I also have a number of SEO clients for whom I regularly post on Facebook (like the service my reader asked about), and I do not even charge them for the service. I think a lot of them may not even know that I’m posting for them, because I often fail to “toot my own horn,” so to speak, to tell people what I’m doing for them. For these SEO clients, I don’t post on Facebook because of any value it has for SEO. Rather, it’s so that their Facebook business page stays current with regular activity, and so that Facebook won’t deactivate the page due to inactivity. Why does someone offer this Facebook posting service and call it SEO? Well, it’s easy to do and extremely inexpensive, so they’re making a very high margin on the service. And even though it has no value for SEO and probably has no value to the business, it’s highly visible. So the business who subscribes to the service can see the activity and feel like they’re getting something for their money–even though they’re not. The real SEO work that I do is mostly invisible. The client can’t see my code changes, or server optimizations, or all the work that I do out in the “ether” in creating citations and backlinks. The clients who measure their revenue growth, and ask new customers “How did you hear about us?” know the tremendous value of what we deliver. But they can’t see any of the SEO work. That begs the question: What does work for SEO? And what is SEO anyway? Picking the right terms to target. This can make the difference between getting found by 5 people or 5,000. Often the best terms are not the most obvious ones. Optimizing your website so the search engines understand what you’re all about. This includes website code, title tags, description tags, local search schema, alt tags, and quality hosting. Building accurate and well-thought-out directory listings for your business (citations). Building quality inbound links (backlinks). These are very hard to do right, and can hurt you if done wrong, so typically you will want to steer clear of a cheap backlink service. Managing and improving your online reputation (reviews). There are lots of other ways besides SEO to get people to your website and to get new customers for your business, like social media, PR, content marketing, email marketing, online advertising, direct mail, media advertising (in TV, radio, magazines, etc. ), mail inserts, billboards, and more. But SEO is often the most cost effective. The best way to measure traffic is to install some type of analytics software, like Google Analytics (but there are others) and track the website visitors. Measuring traffic is not always the best way to measure success. It is possible with a good local SEO campaign to get lots of new customers with a proportionately smaller increase in site traffic. And it’s possible to increase site traffic a lot without significantly increasing your business. Ultimately the best measure of success is business growth?more customers and more revenue?and it is very helpful to ask each new customer how they heard about you. It’s also very important to look at how well your website converts visitors (traffic) into leads (potential new customers who are contacting you). If 1,000 potential customers come to your website but only 10 of them contact you, that’s a pretty low conversion rate. For that matter, your website itself can increase or decrease your referral business (without reference to any SEO), because people who are referred to you often check out your website first, and your website may determine whether or not they actually call. Marketing strategies are not a one-size-fits-all solution. There are quite a wide range of options for you, not only for SEO (ranging from a light SEO campaign all the way up to a very intensive campaign), but also for your website, social media, and other ways to improve your marketing. Typically I make recommendations for my clients based on what they’re wanting to accomplish, how much they want to grow their revenue, and what the overall marketing budget is. So I ended up inviting my reader into a conversation where we can decide on a strategy together based on a reasonable budget for their specific goals. Windows 10 update warning (today only)! 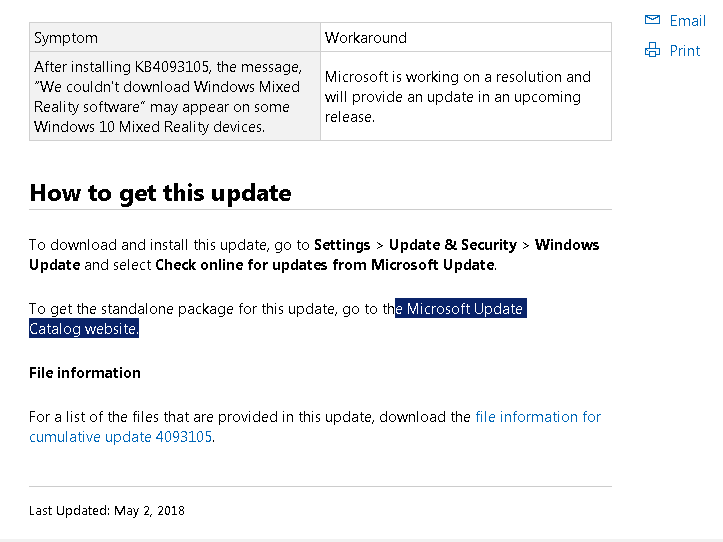 If your computer automatically updates Windows or you use Check for Updates to update your computer this week, you might be dead in the water. Instead, you can manually install the Windows updates. For those of you who don’t have an IT department, I’ll summarize and clarify some of the details. 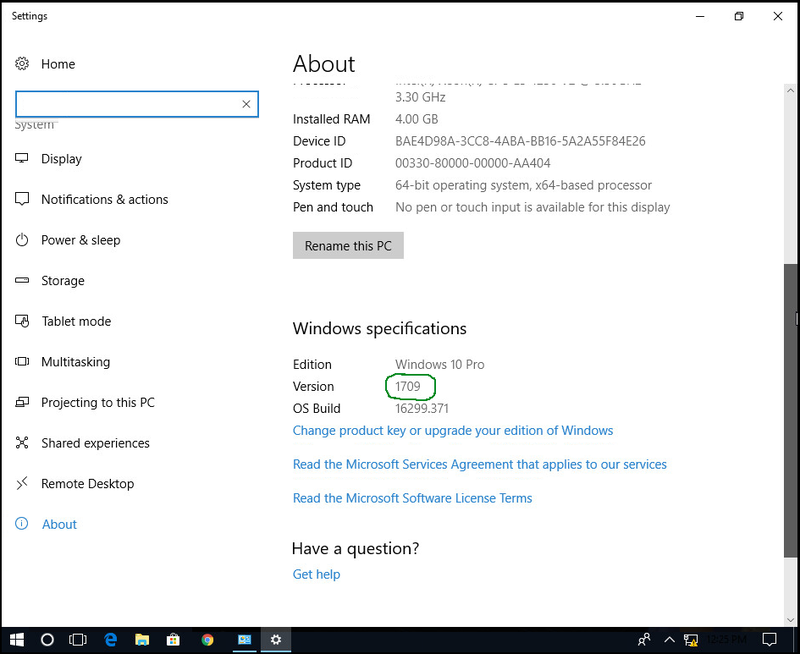 Most of us are on Windows 10 version 1709 and will soon be updated to Windows 10 version 1803 via Automatic Update (which is the version that has issues). However, if you manually update your PC by installing the latest patches, you can avoid the issues. Here’s how to check what version of Windows 10 you are on. 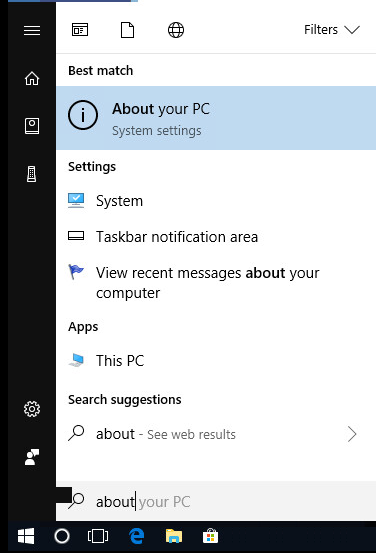 From the start menu, type “About” and open up About your PC. Scroll down in the About window until you find your version number. If you already have version 1803 and your computer is working, congratulations! You don’t need to do anything. If you have 1709 or earlier and want to avoid the risk of affecting your machine with Automatic Update, read on. Installing updates manually takes a little extra time, but hopefully it helps you avoid some much bigger issues!